For Passover, we are told to change over all our dishes and cutlery for the week of Passover, but I don’t focus on that so much as cleaning my kitchen so it is ready for the holiday, which requires certain foods be avoided (anything made with yeast, for example) and recommends special foods made just for this holy day. So, I clean out my refrigerator and remove some of the food items such as vinegar, oil, etc. and give it away as part of removing foods not kosher for Passover. Or I place other items that are unopened or otherwise needing to be saved and make them “off limits” during Passover, either on special shelf or a designated area in the dining room. 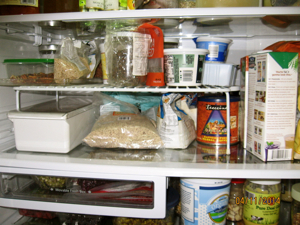 In this process, I recycle containers, dispose of foods that are “suspicious” (When in doubt, throw it out! ), especially because I was away & a couple of items did smell suspicious. 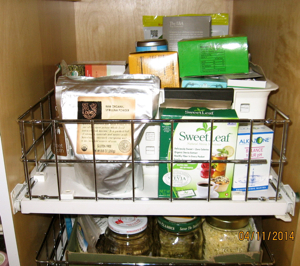 I also rearrange my pantry shelves, using up as many opened pastas not suitable for Passover, grains or beans in open packages, and often changing around my shelves to make items more accessible. I also come across items I forgot about, like my sun dried tomatoes, and make a note to use them up. When the job is done, which it will be sometime this week-end, I feel much more organized in my kitchen. This year I plan to use a different set of dishes made from glass as my nod to changing over the china used the rest of the year. 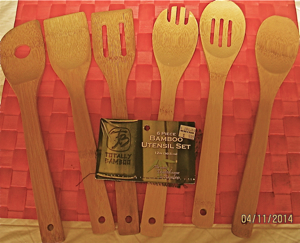 I also purchased a new cutting board and some bamboo utensils. Do the Earth a favor….Do Bamboo! Finally, I used a green cleaning product from Trader Joe’s called Next to Godliness, from the saying, Cleanliness is next to Godliness. Not sure I agree with the saying, but the product works well and I will feature it on another Earth Day, Every Day with a posting on green cleaning products not just for the kitchen. This entry was posted on Sunday, April 13th, 2014 at 10:33 am	and is filed under Kitchen Nutrition. You can follow any responses to this entry through the RSS 2.0 feed. You can skip to the end and leave a response. Pinging is currently not allowed.